The primary outcome of Agile is achieving better business results. This is why outcome based measures are much more aligned with Agile then output measures. Output measures focuses on how much you delivered, while outcome measures focus on the results of what you deliver. It is the results (aka, the outcomes) that matter. Outcome based measures are drivers to help you understand business success. You may still need some output measures to help you on your way. Just ensure that they are relevant to help you determine if you are reaching the outcomes you are looking for. The output could be the delivery of a release or the number of releases. The outcome is how many customers either bought or used the product release. Often times people focus on outputs because they tend to be easier to measure or are a carry-over from a more traditional mindset. The danger of focusing on outputs is that you may have a high number of outputs with a low number of outcomes. 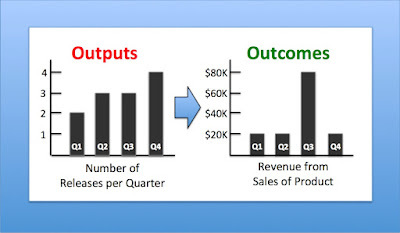 Outcomes are what drive business success. As illustrated in the chart, it appears that the output of the 4th quarter is best. 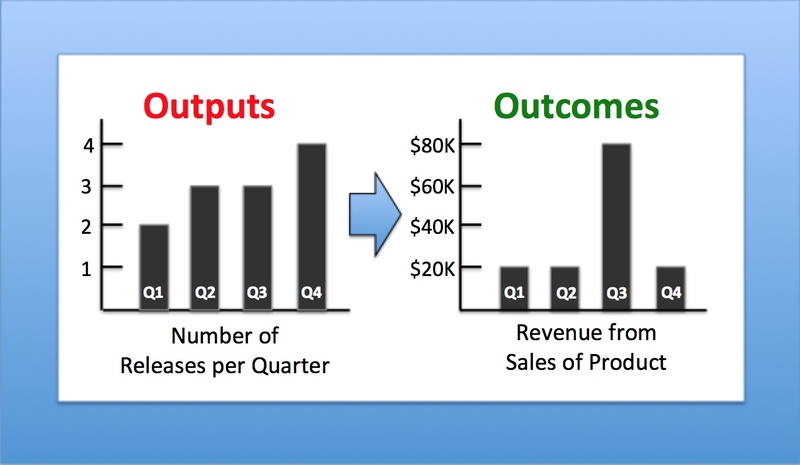 However, if you look at the outcomes chart, the 3rd quarter is better with revenues of $80,000 instead of only $20,000 from the 4th quarter. While the output of four releases sounds good, $20,000 is not favorable to good business results. Outcomes ask you to measure different things, with a particular focus on customer value. In addition, an outcome focus changes our perspective from internal to a customer or external focus. This helps us better understand what we are aiming for in the customer value-driven world we need to establish. So next time you are considering measures of success, just remember that outcomes matter!